1. In a village, number of male, female and children are in the ratio of 3:5:7. If 90% of the males are literate, 80% of females are literate and 40% of children are illiterate, find the number of percentage of illiterate persons in the village. Let the number of male female and children in the village be 3x, 5x and 7x respectively. 2. A man deposited Rs. 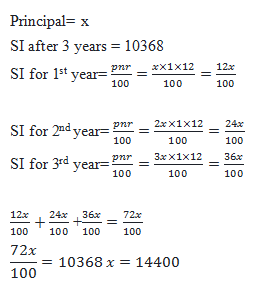 x at the rate of S.I in the beginning of first year and he increased his deposit by Rs. x at the beginning of every year. After 3yrs he got total amount Rs. 10368. If the rate of interest is 12% per annum then find the value of x. 3. In a school XYZ, there are 30 more girls than boys in class X. If the number of boys is increased by 20% and the number of girls is also increased by 10%, there would be 24 more girls than boys. What is the number of students in the school? 4. A circle whose area is 5544 sq. cm has circumference equal to the perimeter of a rectangle of length 75 cm. Find the area of rectangle. 7. Anand had 500 mangoes of which 20% were rotten. Earlier, Anand had planned to sell each mango at 20% above the cost price. Now, he removed the rotten mangoes and sold the remaining at 50% above the planned selling price. Find his overall profit percentage? 8. In an examination marks of P, Q and R, P scored 20% less than Q and scored 33 1/3 % less than R. Find the percent by which Q’s score must increase so that he scores as many marks as R.
9. A car travels x km at 60 km/hr and another 3x km at 90 km/hr. Find its average speed over the entire distance. 1) In a village, number of male, female and children are in the ratio of 3:5:7. If 90% of the males are literate, 80% of females are literate and 40% of children are illiterate, find the number of percentage of illiterate persons in the village. 2) A man deposited Rs. x at the rate of S.I in the beginning of first year and he increased his deposit by Rs. x at the beginning of every year. After 3yrs he got total amount Rs. 10368. If the rate of interest is 12% per annum then find the value of x. 3) In a school XYZ, there are 30 more girls than boys in class X. If the number of boys is increased by 20% and the number of girls is also increased by 10%, there would be 24 more girls than boys. What is the number of students in the school? 4) A circle whose area is 5544 sq. cm has circumference equal to the perimeter of a rectangle of length 75 cm. Find the area of rectangle. 7) Anand had 500 mangoes of which 20% were rotten. Earlier, Anand had planned to sell each mango at 20% above the cost price. Now, he removed the rotten mangoes and sold the remaining at 50% above the planned selling price. Find his overall profit percentage? 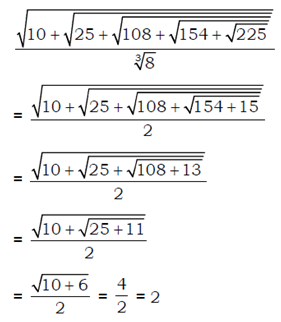 8) In an examination marks of P, Q and R, P scored 20% less than Q and scored 33 1/3 % less than R. Find the percent by which Q’s score must increase so that he scores as many marks as R.
9) A car travels x km at 60 km/hr and another 3x km at 90 km/hr. Find its average speed over the entire distance.